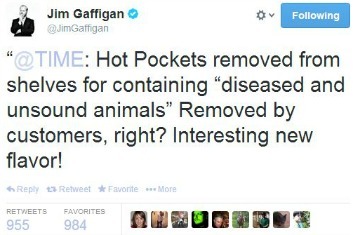 If Jim Gaffigan Is Involved, a Hot Pockets Recall Might Not Be So Bad, Right? Hot Pockets is in on the joke. There’s been a huge USDA recall of meat coming from the Rancho Feeding Corp, with the department’s Food Safety and Inspection Service pulling 8.7 million pounds because it’s “unsound, unwholesome or otherwise are unfit for human food and must be removed from commerce.” Some of that meat may have ended up in Hot Pockets, so Nestle is also recalling some of its products, namely, the Philly Steak and Cheese and Croissant Steak and Cheese. That’s a whole lot of questionable food in one paragraph. However (and surprisingly), no one seems to have gotten sick, so that’s a definite plus. The news gave fuel to one man who has basically built his career on the microwaveable treat: Jim Gaffigan. The tweet above is one of a few that Gaffigan posted on his timeline, all of them tapping into the fact that Hot Pockets aren’t so good for you even when the meat is given the USDA’s thumbs up. There are just some things found on grocery store shelves that consumers will buy even though they know they should be eating fruits and vegetables. 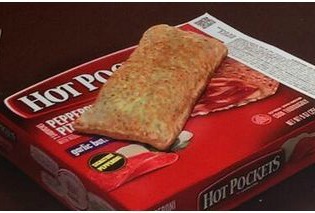 Hot Pockets is one of those things. So healthy isn’t one of Hot Pockets’ selling points. Rather, the brand has chosen to emphasize how easy they are to make. And they’re clear about being in on the joke. Exhibit one: this. Exhibit two: this (which, incredibly, we’re only now seeing). On a serious note, Hot Pockets is using its Twitter feed to tell people which of its products are off limits. But, yeah, those two tweets are the only serious things on the whole feed. And in case you’ve never seen Gaffigan’s bit, it’s pretty darn funny.